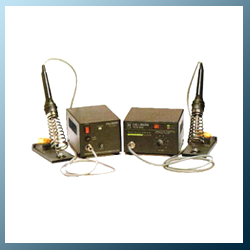 Analog Temperature Controlled Soldering Stations Manufacturer,India. We are Manufacturer, Supplier of Analog Temperature Controlled Soldering Stations,Temperature Controlled Soldering Stations.Compact TCS-450/350 F series are an ideal hand soldering systems incorporating all features necessary for professional electronics assembly work. TCS-450/350 F Series comes complete with a special 17V / 35W and 24V / 50W leakage proof iron and is grounded for MOS and CMOS applications. The unit is extremely simple to use, featuring illuminated power LED, Proportional ON-OFF temperature controller and temperature indicating LED bar graph. Powder coated stand for iron holding & tip cleaning sponge are provided with every unit. Soldering of electronic components having electrical or thermal sensitivity, like CMOS circuits, FET transistors, LED & LCD displays. Soldering with high standard to the soldering connections, Military aviation and space research. Soldering with special solder (High & Low melting) connections, with exact tolerance.